Caption slip reads: "Photographer: Mitchell. Date 1957-07-24. Reporter: Waymire. Assignment: Brainstorming session. 57: Allen McGinnis, A.W. Neally, Joy Bullard, Chief W.H. 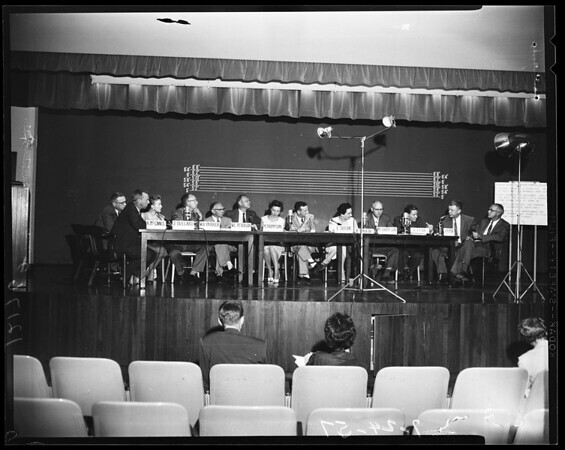 Parker, W.C. Peterson, Stuart Devonald, Mary THompson, Carroll Sugar, Evelyn Spalding, M. Lewis Thompson, Laird Koenig, E.J. Coy and H.P. Almon. 58: Allen McGinnis, A.W. Neally, Joy Bullard, Chief W.H. Parker, W.C. Peterson, Stuart Devonald."